Despite earlier threats, Disney do seem to be making some forays back into the realms of 2D animation, although Enchanted has animated bookends around a lengthier live action midsection. It seems surprising that nobody has thought of doing a film where animated characters are banished to the real world, about the only thing I can think of being an early Treehouse of Horror Simpsons episode. Given the post-modern ironic twist on the fairytale, the producers turned to Alan Menken to provide a surprisingly straight up animated musical score, the likes of which the composer hasn't written in some considerable time. As usual, the album starts with the songs which are a perky and enjoyable bunch, although given the tone of the film, there is some element of self parody, especially Happy Working Song which amusingly spoofs all those light hearted scenes in Disney's classic animations where the lead girl and assorted woodland creatures do domestic chores, although the references to toilets and cleaning products rather take it away from the usual fairytale environs. The romantic aspect is ladled on heavily, between searching uncertainty (although still hitting a power ballad climax) in So Close to the full on power pop of Ever Ever After which is a bit cheesily predictable. Then again, the bouncing, hispanic rhythms and joyous interplay between the vocal lines of That's How You Know are a nice change of pace while True Love's Kiss is closer to parody, but with a delightfully engaging tune and some arranged with Menken's typical panache. 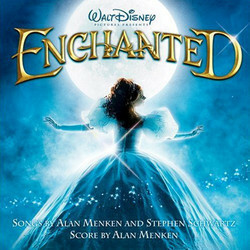 After his great work on Hunchback of Notre Dame, it's something of a disappointment that Menken hasn't had much of a chance to write some dramatic underscoring of late, but Enchanted offers a number of moments, notably Into the Well and Narissa Arrives, the latter replete with epic chanting chorus. As usual, Menken deftly weaves in the song melodies here and there, not to mention a snippet of Beauty and the Beast from the film of the same name at the opening of Nathaniel and Pip, which also has a healthy dose of drama elsewhere, interspersed with some manic Stalling moments. However, like Alan Silvestri, Menken does this kind of writing supremely well and it rarely becomes tiring. A more contemporary sidestep is made in the guitar laden Girls Go Shopping, based on the Ever Ever After. The score finishes with the grand Storybook Ending, which features some fine action writing, even a couple of Goldenthal-esque horn trills, but things calm down for the Enchanted Suite, which is the predictably magical arrangement of the major themes and bringing the score to a fine close. Perhaps the only real downside to Enchanted is the slightly uneasy mix of traditional Disney and the contemporary aspects. Previously, Menken had always manage to spin off the single version of the love song without it sounding too far from the soundtrack's original sound world, but So Close and Ever Ever After are just a bit too far away, as is Girls Go Shopping which, while perfectly entertaining in its own right, doesn't exactly gel. Not perhaps destined to go down as one of Menken's top rank efforts, but certainly notable for its fine underscore which would be fine for any film, but compared to the usually rather pallid and temp track laden accompaniment written for films of this type, it's truly excellent work. Here's hoping Menken gets a few more high profile assignments once more.